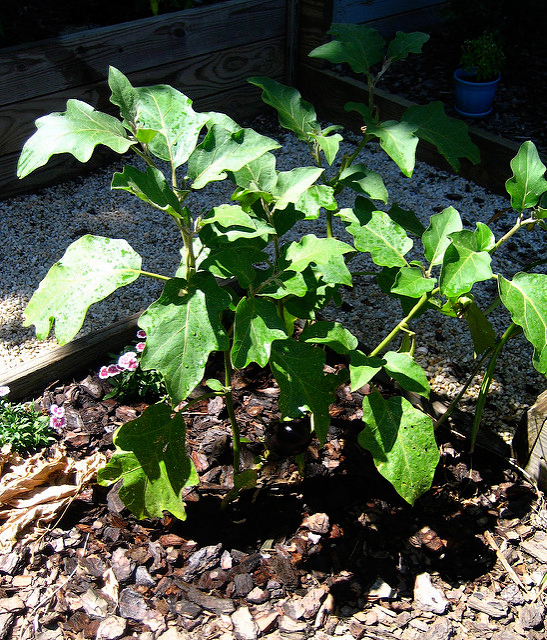 Eggplant or Brinjal (Solanum melongena) is an important solanaceous crop of sub-tropics and tropics. 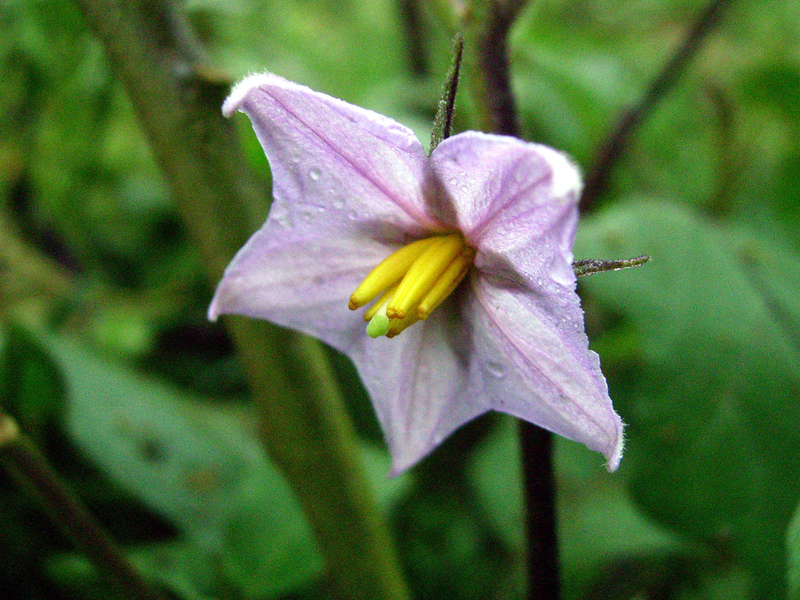 It belongs to nightshade family which also comprises potatoes, peppers, tomatoes and sweet peppers. The term brinjal is general in Indian subcontinents and is derived from Arabic and Sanskrit while the name eggplant has been derived from the shape of the fruit of certain varieties, which are white and resemble in shape to chicken eggs. It is said to have originated from India and China but is now popular vegetable in Southern Europe also, particularly in the Balkans, France and Italy. It is also called aubergine in North America and Europe. Some popular common names of Eggplant include Brinjal, Mad Apple, Jews’s Apple, melongene, garden egg, Aubergine and guinea squash. It is a very significant common man’s vegetable in India. It is also called a poor man’s vegetable simply because it is popular amongst small-scale farmers as well as low income consumers. Since it is known as poor man’s crop, but brinjal is also called by some as the ‘King of Vegetables’. Chinese Eggplant, White Eggplant, Thai Eggplant, Indian Eggplant & Indian Paint Eggplant, Chinese Round Mauve Eggplant, Sicilian Eggplant, Japanese Eggplant, Pingtung Long Eggplant, Pea Eggplant, Italian Eggplant, African Garden Eggs, Black Beauty Eggplant, Arka Kusmukar, Pusa Purple Long, Pusa Ankur, Manjri Gota, Pusa Purple ClusterPusa Barsati, Vaishali, Arka Navneet, Arka Sheel and Pusa Kranti are some well-known varieties of Eggplant. 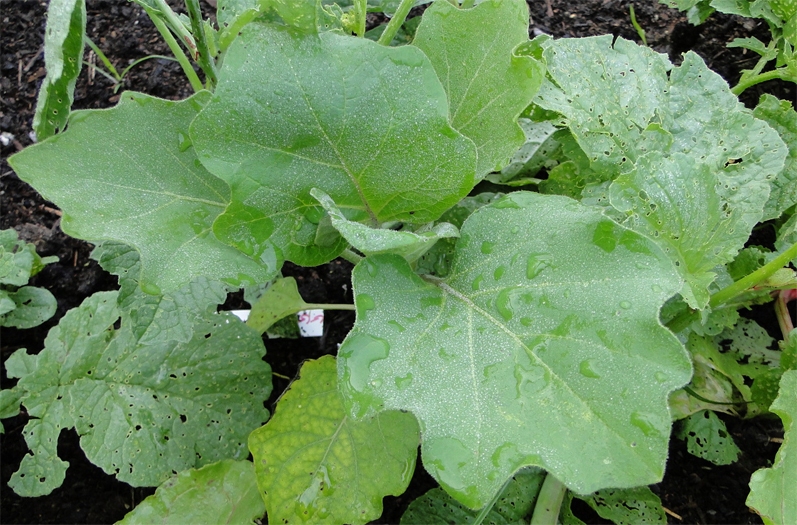 Eggplant is an annual herb to short-lived perennial sub-shrub sized 40 to 150 cm (16 to 59 in) tall which is normally seen growing in tropical and cool temperate climate and grow well in full sun and ample water. 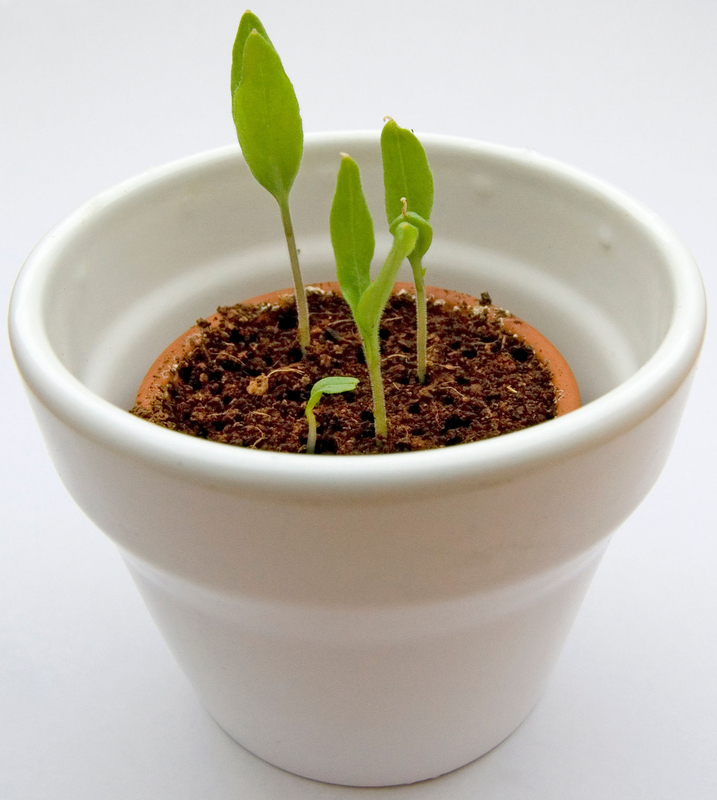 It prefers rich, fertile, well-drained soil, and hates waterlogged and intensely acidic soils. Roots are usually long taproot with non-woody, spiny stem which is pubescent with stellate hairs. Leaves are simple, alternate, large; coarsely lobed that is 10 to 20 cm (3.9 to 7.9 in) long and 5 to 10 cm (2.0 to 3.9 in) broad. Brinjal flowers are large, violet colored and solitary or in clusters of two or more. Flowers are star-shaped and have short stalks, 5 stamens attached to the corolla tube and a single superior ovary. Eggplant or aubergine is a delicious vegetable which is found growing in a variety of shapes and sizes. 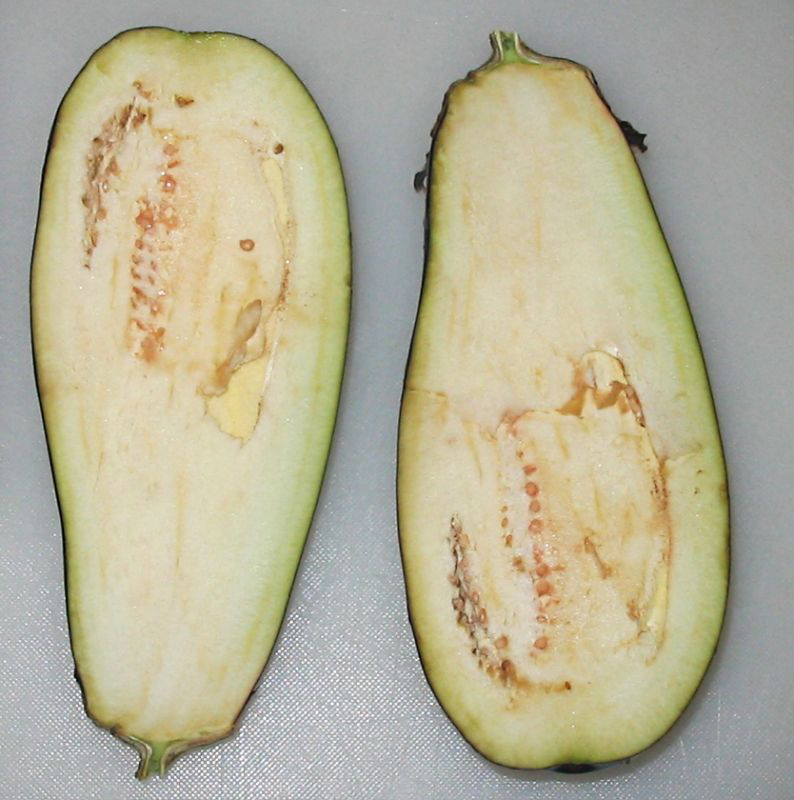 Eggplant is depressed globose to ellipsoid, globose, ovoid, obvoid, elongate or even serpentine shaped Berry, 2–35 cm long (sometimes longer) and 2–20 cm broad with many seeds inside. 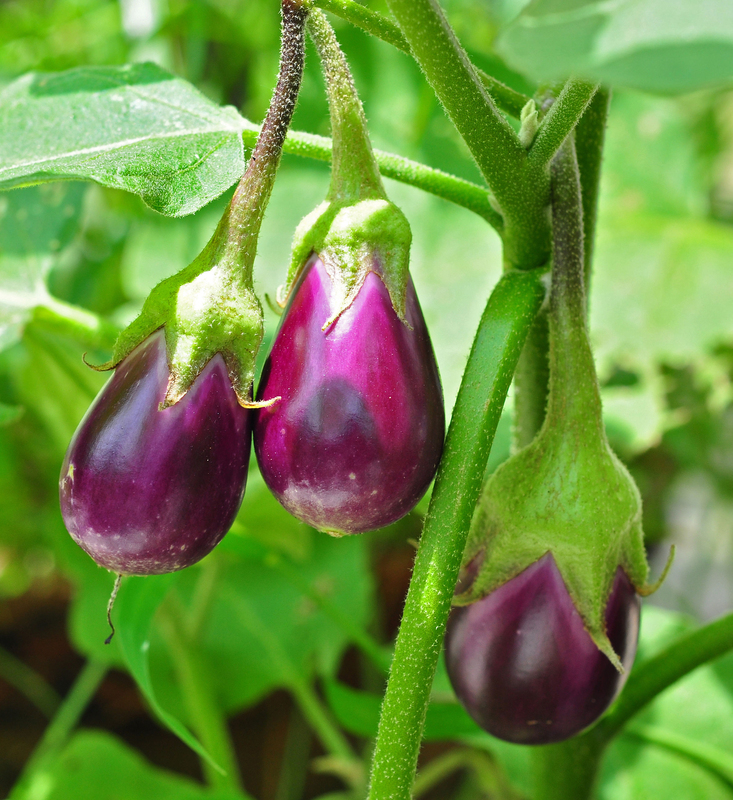 Color of eggplant may differ according to varieties which may range from purple, white, yellow, green, pale violet-purple hues to black, occasionally netted (variegated) or streaked, when ripe. It has thin smooth, glossy skin externally and white color pulp with numerous centrally arranged small, soft seeds internally. It has bland type of flavor and slightly bitter in taste. 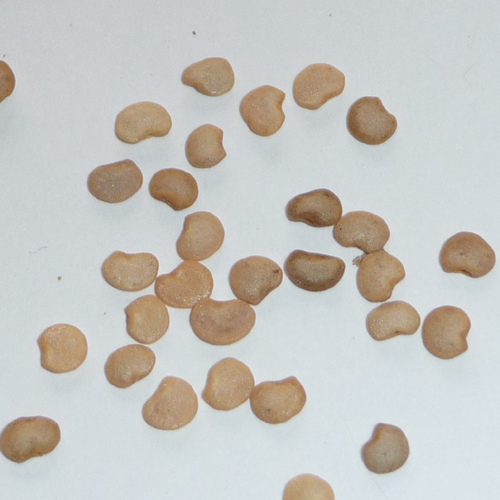 Seeds are enticular to reniform, flattened, pale brown, 2.8–3.9 mm long and 2.5–3.5 mm wide. 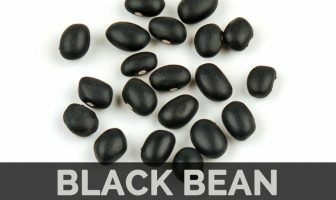 It is a very low calorie vegetable and has healthy nutrition profile so it is one of the best foods for weight watchers! Its “meaty” texture makes eggplant a staple in vegetarian diets. The exact center of origin of Eggplant is still controversial and debatable. 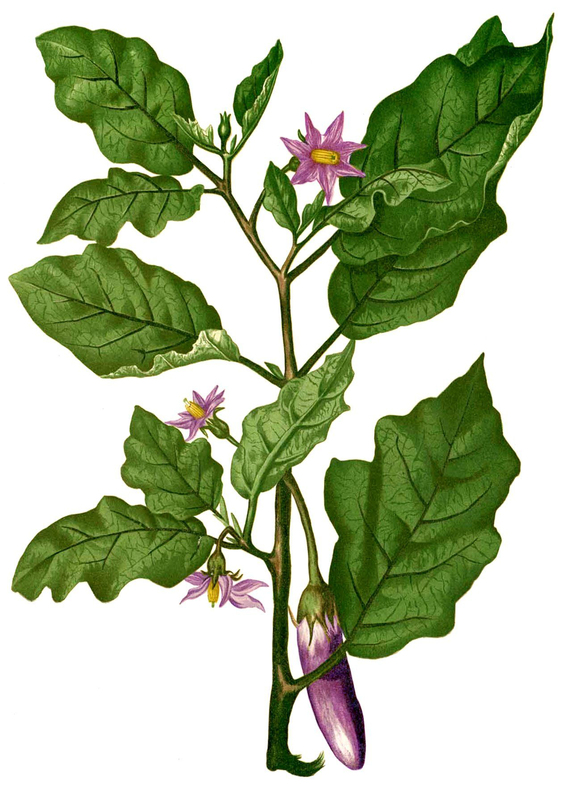 The most commonly assumed region for the domestication of eggplant (Solanum melongena) is India, though China has an equally old written record of eggplant use dating about 2,000 years ago. But now it is grown in many tropical and semitropical regions throughout the world. Apart from their slightly bitter taste Eggplant is a good source of nutrients, vitamins and minerals. Consuming 82 gram of Eggplant offers 0.19 mg of Manganese, 0.066 mg of Copper, 2.5 g of Total dietary Fiber, 0.069 mg of Vitamin B6, 0.23 mg of Vitamin B5, 18 µg of Vitamin B9 and 188 mg of Potassium Moreover many Amino acids like 0.007 g of Tryptophan, 0.03 g of Threonine, 0.037 g of Isoleucine, 0.052 g of Leucine and 0.039 g of Lysine are also found in 82 gram of the Eggplant. 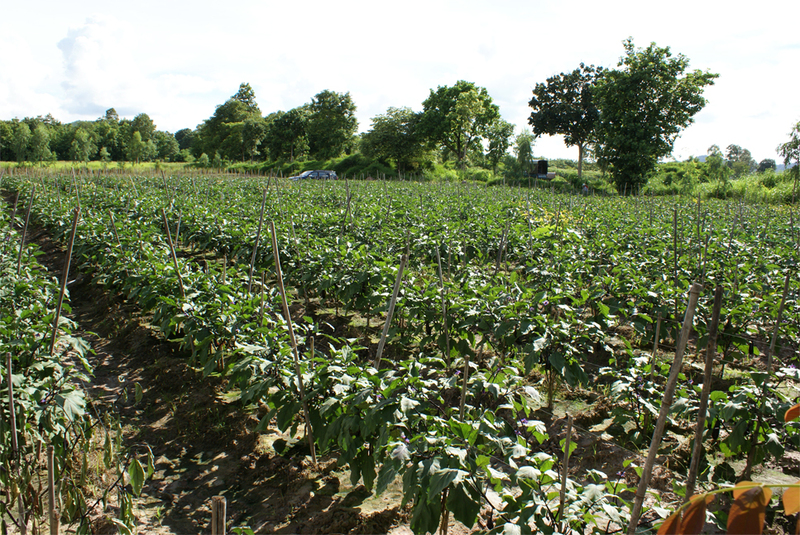 Brinjal or eggplant is an important crop of sub-tropics and tropics. It supplies 25 calories per serving and has virtually no fat. 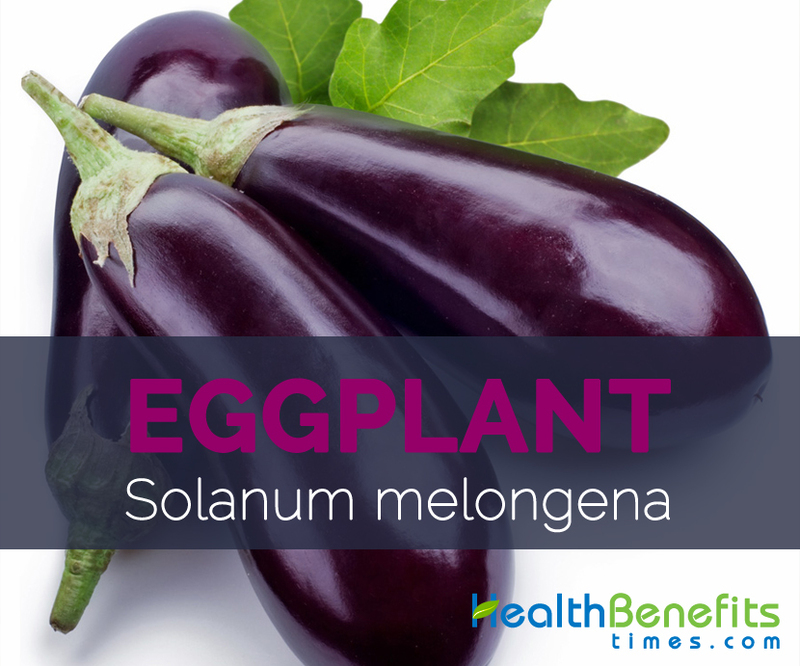 Its “meaty” texture makes eggplant a staple in vegetarian diets. Eggplant is also called as the ‘King of Vegetables’ because it is found used by most of the people around the world. Due to its low calorie it is one of the best foods for weight watcher. As brinjals are low in carbohydrates and high in fiber content, they are identified to be good for people suffering from diabetes. It is because, the high fiber causes helps in managing blood sugar levels in the body by controlling the absorption of glucose from food. Eggplants consists of huge amount of magnesium, potassium, calcium and phosphorous. All these minerals help in maintaining electrolyte balance in the body. It also helps in neutralizing the effects of sodium on the body thereby helping in blood pressure control. Apart from this, increased intake of anthocyanins which is present in considerable amounts in brinjal also lowers your blood pressure. It also has chlorogenic acid that acts as a powerful antioxidant agent, lowering cholesterol levels in the body. Brinjal also comprises high amounts of fiber which increases the absorption of blood cholesterol by the liver to produce bile. As we all know that Folates are vital parts of any diet, and folic acid is mainly beneficial for pregnant women. Folic acid directly defends infants from neural tube defects that can manifest in a number of ways. Therefore, it is always suggested that expecting mothers increases their folic acid intake to account for their other dependent mouth inside! Eggplants are rich sources of folic acid, which makes a delicious and useful snack or dietary addition when pregnant. Iron deficiency is extremely dangerous to overall health, and it can manifest in anemia. Anemia is described by headaches and migraines, weakness, depression, fatigue and cognitive malfunction. Consuming food high in iron can help to combat anemia, and eggplants consists of considerable amount of iron in their meaty, edible fruit. Similarly Eggplants are very rich in copper, another essential component of red blood cells, just like iron. Without these two minerals, the red blood cell count in the body will continue to decline. With healthier, red blood cells flowing through your veins, you will see a noticeable boost in energy and strength, and exclude feelings of fatigue or stress. Fruit can be eaten fresh or after rehydration of dried slices. In Southeast Asia, slices of the raw fruit of certain varieties are consumed as ulam or in a vegetable salad or as lalab. Most often the fruits are eaten fried, steamed, grilled, or stewed with other vegetables, meat or fish, cooked in curries, or roasted, braised in ashes and seasoned with onion, garlic, spices, chillies, belacan (shrimp-paste), oil, soya sauce, sugar etc. Eggplant is extensively used in numerous cuisines – achar, dalma, chutney, sambhar and curries in India. The fruit can be stewed as in many south Asian and Middle Eastern cuisines – Iranian khoresh-ebademjan Turkish karnıyarık or musakka , in French raratouille and Italian parmigiana di melanzane. Fruit with complete skin can be roasted till burned and the pulp removed and mixed with other ingredients like lemon, tahini, and garlic as in the Greek dish melitzanosalata and the Middle Eastern Levant dish of baba ghanoush. Eggplant is grilled, mashed and blended along with onions, tomatoes and spices in the Indian dish baingan ka Bhartha or gojju. Roasted eggplant is mixed with roasted red peppers, tomatoes, chopped onions, mushrooms, celery, carrots and spices in the Romanian dish zacuscă , ajvar in Serbia and the Balkans. Strips of roasted eggplant, tomato, sweet pepper and onion are used in the Catalan cuisine escalivada. Begun-Pora (eggplant-charred or burnt), is common in the east Indian state of Bengal and Bangladesh where the charred pulp is combined with raw chopped onions, salt, green chilies and mustard oil. Fruit is sliced and deep fried, and served with plain yogurt topped with tomato and garlic sauce as in the Turkish patlıcan kızartması or without yourt in patlıcan şakşuka. In Turkey, the most famous eggplant cuisine is the vegetarian İmam bayıldı and Karnıyarık with meat. Fruit can also slice, battered and fried and served with tahini sauce, tomato sauce or tamarind. Fruit can also be stuffed with minced meat, minced crab, fish-paste, and prawn paste and baked, fried or stewed. Eggplant is stuffed with walnut paste and fried in the dish nigvziani badrijani in Caucasus. Eggplant is stuffed with ground coconut, peanuts and masala and cooked in oil in India. In Chinese cuisines, eggplant is steamed, stewed, braised, stuffed and fried. Fruits are also made into pickles in vinegar e. g. ‘torshi betingen’ in West Asia (Iran, Egypt) or sweet jam (Turkey, Greece). Fruit can be preserved by canning, freeze drying or air-drying, e.g. Turkish ‘dolma’. Fruit is cooked along with ghee and sugar to make an appetizer called pacheri. Several parts of plant are used in decoction, as powder or ash for treating ailments such as diabetes, bronchitis, haemorrhoids, cholera, dysentery, dysuria, asthma, toothache, skin infections, asthenia and otitis. Eggplant is also considered to have narcotic, anti-asthmatic and anti-rheumatic properties. Ashes of the fruit had been recommended for use in a dry hot poultice on haemorrhoids in Malaysia. Root juice was administered for problematic labor in Ambon. Leaves mixed with stem bark are used as a remedy for dysentery in the Guianas. Powdered root is used externally and taken internally to cure bleeding and for asthma. Root sap is used in French Guiana for tooth-ache and otitis. A warm frit paste is applied to painful joints in Surinam. Eggplant is known to have Ayurvedic medicinal properties and is good for diabetic patients. It has also been suggested as an excellent remedy for those suffering from liver complaints. All parts of the plant can be used to stop intestinal bleeding in Traditional Chinese Medicine. Fruit of the plant is used as an antidote in cases of mushroom poisoning. Parts of the plant are used as a purgative in Indochina. The root is pounded and applied inside the nostrils to treat ulcers. In Peninsular Malaysia, the people of the Bera River used to place the prickly stems on the threshold during the first rice harvest as a form of defense against evil spirits. Capsicum violaceum Humb. et al. Calories 20 Kcal. Calories from Fat 1.35 Kcal. Calories 33 Kcal. Calories from Fat 2.07 Kcal. Calories 35 Kcal. Calories from Fat 2.07 Kcal.